Often times when your door won't open it's because your home is in need of a garage door spring repair. Unfortunately in most situations a homeowner doesn't realize their springs need to be repaired until it's too late. The Garage Door Pros are happy help during these times as we provide repair services for all spring types. Often times this damage can be avoided by a simple tune up. Give us a call and we will come and perform all the adjustments that your door needs in order to be returned back to smooth operation. Torsion garage door springs are the big springs located at the top of your door. When these springs are not working properly you may have a garage door that will not go up. These springs are under very high levels of torsion and working on them can be very dangerous. Please call a certified Garage Door Pro for repair. Extension springs are found on the sides of your garage door and assist your door opener in lifting and closing. Over time these springs can become stretched to their limit and no longer provide proper support. Providing prompt service and a full inventory of springs we will save you the headache of doing it yourself. Best garage door spring repair practices. The last thing you want happening is to be held hostage to a garage door that doesn't open. This can often be the case when one of your garage door springs break. To prevent this situation from happening the Garage Door Pros always practice industry recommended repair methods. Garage Door Spring Repair Comes In Two's. Most garage doors require two springs. If one spring brakes, it is likely that the next will soon follow. Therefore to avoid any future inconveniences or damages to your door opener the Garage Door Pros always recommend replacing both springs. 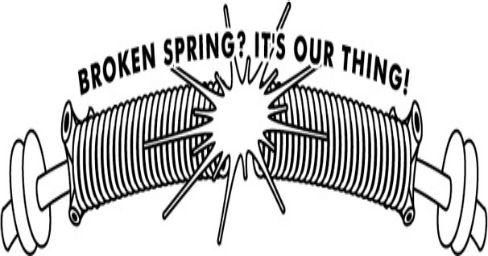 Because we have an inventory of springs we can match the right spring to your door. Don't waste your time and energy trying to measure, call, and figure out what size spring your door requires. Call the Garage Door Pros LLC and make sure your ﻿garage door repair﻿ is done righ﻿t. Upon installation a Garage Door Pro will continue services further with a general safety inspection. Consequently many times broken springs are the culprit of other door opener issues. Our services technicians will ensure that everything is functioning properly.